I am a firm believer that holiday decor doesn’t have to be over the top. I mean, if you love decorating for Easter with stuffed bunnies, bright green crinkle grass and plastic eggs, go for it! But it’s also OK to have a more understated holiday style. 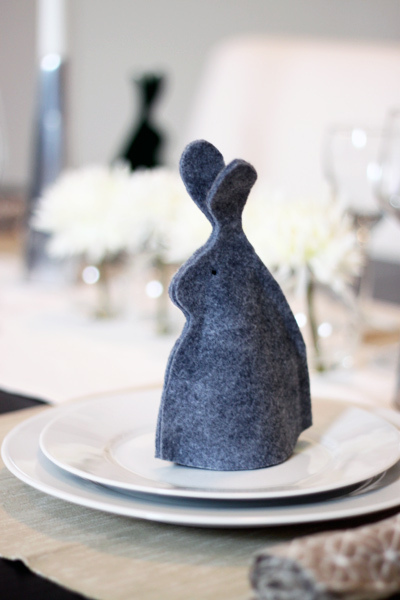 That’s why I crafted these felted rabbit place settings. 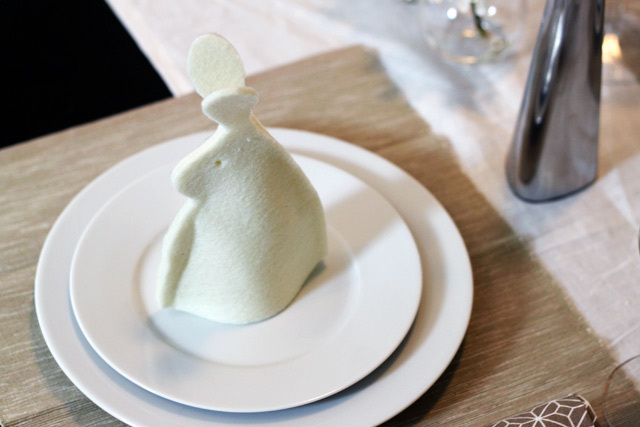 They’re festive and fun without screaming “Easter Bunny!” You could even keep these out on the table throughout the year, customizing the colors to match your table scape. 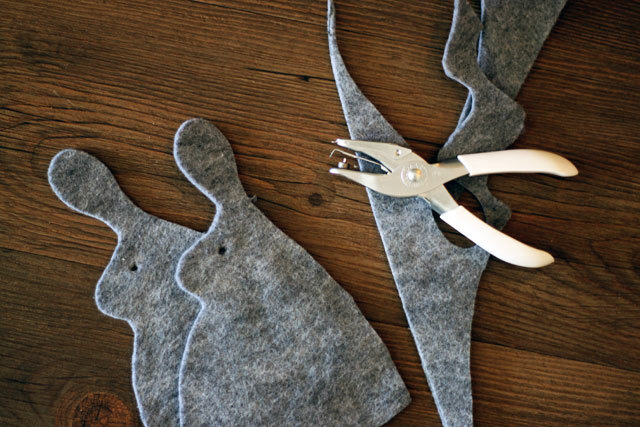 To get started, you’ll need sheets of craft store felt (two sheets for each rabbit), spray adhesive, scissors and either a sewing machine or a glue gun. First, use the spray adhesive to stick two sheets of felt together. 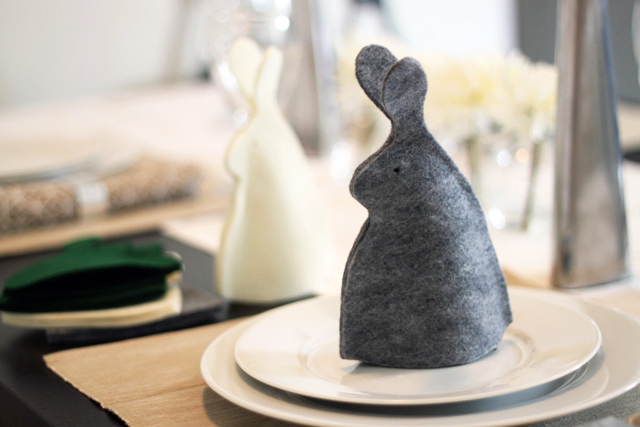 We want our bunnies to stand up, so we’re making the felt extra thick. 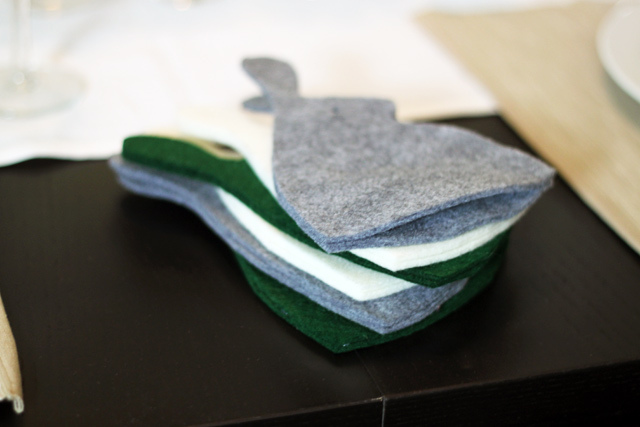 If you can get your hands on thicker felt than what’s commonly sold at craft stores, you can skip this step. 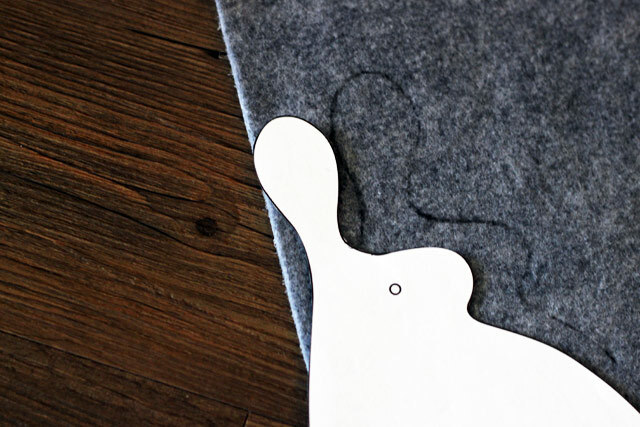 Cut out the rabbit shapes and trace them onto the felt sheet, making sure you’re able to cut two full rabbit shapes from the one thick felt sheet. 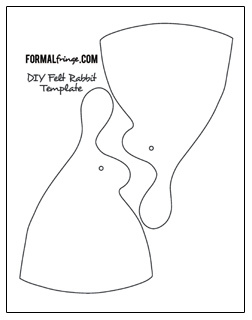 Then, either with a hole punch or scissors, cut out the eye hole on each rabbit cutout. Next, you’ll want to attach the two pieces together. If you’re good with a sewing machine, stitch them together. If not, a glue gun works just as well. The important thing to remember here is that you’re sewing or gluing around the outline of the rabbit only, skipping both the bottom of the cutout and the ears. If you glue the bottom of the shape, your rabbit won’t stand up; if you glue the ears together, you won’t get a cute floppy pair of ears for your table rabbit. 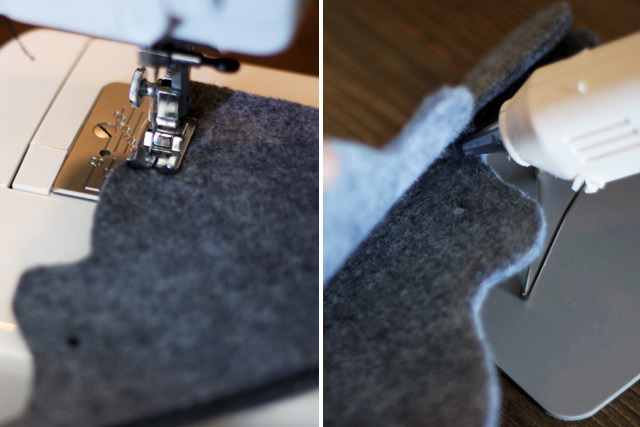 Once you tackle the sewing or gluing (it’s really the toughest part of this super easy DIY), you’re done! Just repeat the process until you have enough rabbits for each place at your Easter table. To stand them up, just press at the sides to form the bottom of the rabbit into a rounded shape. Make sure you fold the floppy ears over, too. I guarantee you’ll get compliments on these adorable place settings. And when your guests ask “Where did you get these?,” you can proudly say that you made them yourself! It will make you want to celebrate Easter all year round. Oh, I love these! How cute! I came to your blog after seeing these bunnies on Craftgawker.com. Thanks for visiting! I’m so glad you like them! You’re very welcome! Hopefully your in-laws will be impressed, haha! so cute! I like that it is a little more understated and mature the the usual Easter fare. So cute! Would it work gluing them together with modpodge? I don’t have a glue gun. I haven’t tried it, but I don’t see why not. I think regular Elmer’s-style glue would work, too. Give it a try and let us know how it came out! I only had simple white, very thin felt, but I added some filling so they stand nicely. I also used small pearls for eyes. Thanks a lot for the model! Thanks so much for checking out my site! Your bunnies look great! Love these! So simple and so much style. So cute! I want it !